I tried my hand at knitting when I first started to sew. I made a bunch of scarves and even knit a sweater, but I seemed to loose interest in the whole thing after my third scarf. (and that sweater was pretty terrible) Every winter I get ‘knit-envy’ when I see photos of cozy cowls, cute mittens and slouchy hats. I would love to make those things! But, I have a feeling I should stick to all the other craft that I’ve got going on. I was super excited when our new teacher, Mariel, suggested a Sewn Mittens class. Yes!! 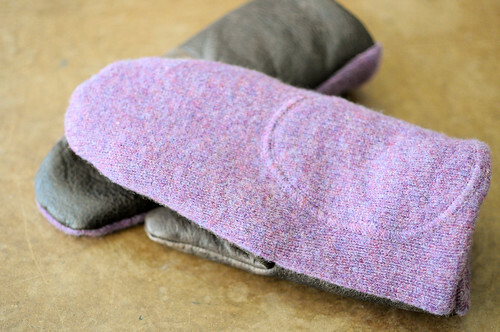 Finally, I can ‘fake’ some knit mittens by sewing them from upcycled sweaters. I love this fun project for all the variation you can achieve by using upcycled goods. 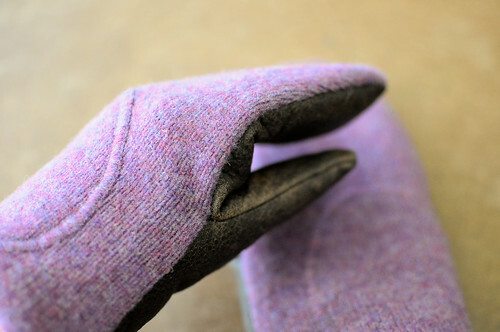 For my mittens I picked up a purple sweater from Value Village. Debbie offered me some of her leather scraps for the palms. The sweater had ‘elbow pad’ details on the sleeves, so I cut my main piece from that part of the sweater. 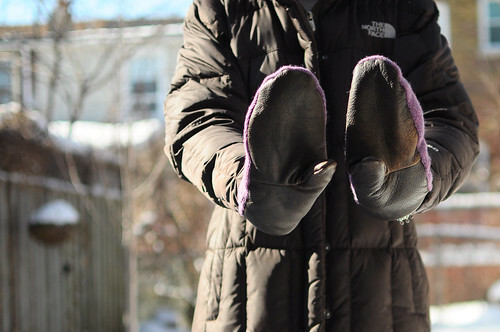 I’ve been wearing my mittens every day. 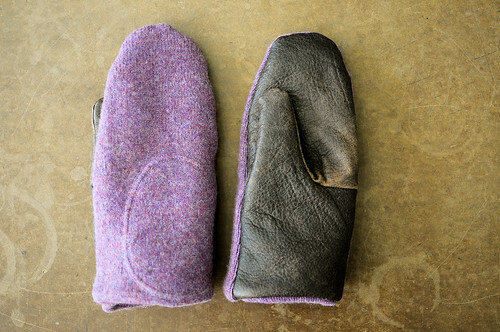 They fit perfectly and are totally cozy and warm. My mom will be happy to learn she doesn’t need to buy me gloves or mittens anymore. In the back of my mind I’m already gathering ideas for next year’s Christmas gifts. These are currently at the top of the list. I’ve got another pair cut out and ready to sew! p.s. You can read a cute interview with me on ‘oh my! handmade goodness‘. The piece was written by Debra Norton of Vintage Paper Parade. Thanks for including me in your piece, Debra! they look SO cozy! That purple is so sparkly! with the mitts class and the moccasins class, my educational wish list is swelling. Those are awesome! I love the elbow patch detail! I am still knitting a pair of gloves I started 2 years ago – and I’m not done the first one yet! I’m adding this to my list of classes to take for sure! knitting is fine for knitters, but the leather here is genius!